By Kori ~ June 22nd, 2009. 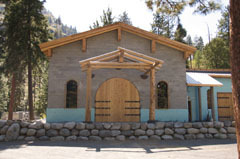 Boudreaux Cellars, located just outside Leavenworth, Washington, was founded by owner/winemaker Rob Newsom in 2001. 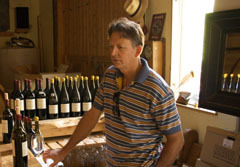 A Louisiana native, Newsom has lived on the property that is home to both his log home and Boudreaux Cellars since 1981. He began making wine in his garage in 1998 and started building the winery facilities in 2001. Boudreaux currently produces about 2,000 cases per year which is exactly the production level that Newsom plans to maintain. We first met Rob Newsom and visited Boudreaux Cellars last summer on a weekend trip to Leavenworth. 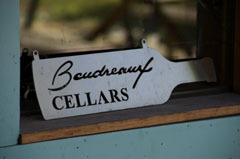 Boudreaux Cellars is best known for its Cabernet Sauvignons which are excellent. We have tasted the 2005 Cabernet Sauvignon on several occasions, rating it as 4.5 stars (out of 5) two out of three times. While it is not inexpensive at $50, given its high quality rating and the high prices of other Cabs on the market, it garners a QPR rating of 5 bangs for your buck (out of 5). Recently, we had the opportunity to taste Boudreauxâ€™s 2005 Reserve Cabernet Sauvignon as well. It is another big, powerful, and complex Cab. Though I personally prefer the regular Cab to this Reserve (tasting note below), it is another impressive effort from Newsom. Since his site is not ideally suited for grape growing, Newsom sources his grapes from many different vineyards around the state. His goal is to get the best grapes from the best vineyards. In fact, most of his bottles are labeled simply Washington State and lists the vineyard sources for that particular wine. While the 2005 Cab is sourced from ten different vineyards, the 2005 Reserve Cab is sourced from only two, Champoux Vineyard in the Horse Heaven Hills and Loess Vineyard in the Walla Walla Valley. In addition to making great wines, Boudreaux boasts a spectacular setting along the Icicle River in the Cascade Mountains. Since it is located four miles off the power grid, Boudreaux is the only winery in Washington State that is completely self-powered. With his Louisiana Cajun accent and dry sense of humor, a visit with Rob Newsom is a real treat. He is a gracious host, very welcoming, and downright hilarious. He truly is one of the great personalities in the Washington wine industry. Only open by appointment, Boudreaux is well worth a visit. If you are going to be in the Leavenworth area, be sure to call ahead to set up a time to stop by Boudreaux to sample their wines, visit with Rob, and take in the beautiful setting. And regardless of whether you are able to visit or not, be sure to try some Boudreaux wines. 2005 Boudreaux Cellars Reserve Cabernet Sauvignon (Washington State): Dark, inky purple. Smoked meats and pencil shavings come through on the nose; black fruits, chocolate, and coffee on the palate. Medium to full-bodied and bone dry with high, drying tannins. Flavorful and lively with a long finish. Still quite young; should soften with age. Nice writeup, Kori! In my opinion, the combination of the setting and Rob’s personality make this one of the best winery-visits in the state. Thanks, Paul. I couldn’t agree more. Boudreaux is definitely one of the best winery visits in the state. And there’s so much to do in Leavenworth that makes it all the more fun to visit. We’ll be about an hour from Leavenworth later this fall visiting family. Is it hard to get an appointment to tour the winery? Abigail, you should definitely visit if you are in the area. It shouldn’t be hard to get an appointment as long as you contact them in advance. For contact info, visit: http://www.boudreauxcellars.com/ContactUs/. Cheers! Just drank the 2004 Boudreaux Cab two nights ago and was floored. I had bought it a couple years ago and forgot I’d had it until I was looking for another wine at my wine locker and stumbled across it. Boy, am I glad I did. Quite possibly the best WA cab I’ve had. Right up there with the Abeja 05 Reserve and the Cayuse Widowmaker. I’m certainly going to seek out his syrah, now. I should have my note on it up on my blog sometime today. Cheers! Sure glad you found that 2004 Boudreaux Cab. It is fabulous, isn’t it? We had it in a special private tasting for Dad’s birthday last fall and it beat the 2002 Quilceda Creek Cab. http://winepeeps.com/2008/12/15/a-very-special-private-tasting-of-washington-cabs/ Cheers!